In this blog post, we look at how Edward de Bono’s theory of the Six Thinking Hats has influenced Kat’s thinking processes. This is not intended to be a guide to this principle and recommend checking out de Bono’s book by the same title or looking at http://www.debonogroup.com/six_thinking_hats.php if you’re interested in finding out more. This is not an advertisement or endorsement. Here at Gradino, we love finding ways to be more effective and more productive. 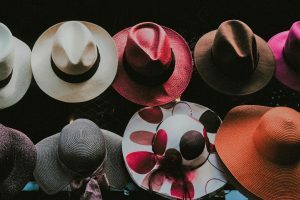 There are so many theories and tools, but recently, Kat stumbled across the Six Thinking Hats theory by Edward de Bono and loved it so much, we wanted to share how we have started using it! We all play many different roles throughout the day: we can be a worker, friend, chef, chauffeur, cleaner – all in a very short space of time. It’s easy enough to be a worker from 9 – 5 and then to be the chauffeur on the way home, merging into chef and cleaner once you get home but have you thought about the different hats you wear during your time in those roles? The blue hat: this is the cool, detached colour of management and the first hat that goes on after meeting a client as Kat makes sense of what lies ahead. The blue hat is trying to ascertain the bigger picture and breaking it down into manageable steps. This hat helps to plan out the structure of the project by looking at the deadline and organising the schedule. The white hat: when wearing this hat, we are only thinking about the cold, hard facts. This is used when we’re looking at information. In meetings, we tend to wear this hat at the very beginning when we’re trying to ascertain what we already know and what we need to find out. For Kat, this may be the first hat she wears after having met with a client – she will sort the facts and make sure she is clear on what is needed. The green hat: this is the hat of creativity and allows the wearer to think up possibilities and new concepts. Kat will wear this hat after she has mulled over the brief and is clear on what the client’s requirements are. Wearing the green hat, she will come up with initial ideas and start playing with various options. The yellow hat: as the colour suggests, when we wear this hat, we are deliberately being optimistic and positive. We are trying to look for the good, or the silver lining. After the first initial ideas, the yellow hat goes on as Kat tries to put herself in her client’s shoes and identify what the strengths are and how these ideas fit with the brief and the brand. The initial ideas are teased into second and third drafts. The black hat: this is the opposite of the yellow hat. Here, we’re looking for the negatives and trying to spot the flaws in an idea. This hat should be used with caution! Being aware of the benefits of the black hat is good – criticism is good when it’s constructive but wearing the black hat for too long can cause doubts. Kat wears the black hat intermittently throughout the process, but she is aware that it shouldn’t be kept on for too long. The red hat: wearing this hat allows you to express emotions and works alongside that gut instinct. This is another intermittent hat; it shouldn’t be ignored but for Kat, it works best when it is time-limited. When discussing initial ideas with a client, it can sometimes be good for us to express a personal feeling towards a design, but it’s the client’s red hat that we need to listen to. Working with projects means that being able to organise your mind and change the direction of those thoughts is a vital skill. Reading more about the Six Hats has made us more aware of our thoughts and how – while all are conducive – some are better suited to different stages.